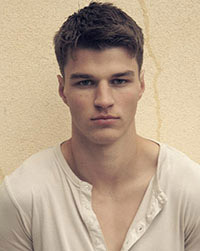 Arran Sly was born in United Kingdom, in 1993, is an British male model. He was discovered whilst out shopping in London, by model scout Cesar Perin at Unsigned in 2012. Arran have a degree in physics. He is best known for his work as a model for Calvin Klein underwear. He like to workout 2-3 times a week. Risbel Cover, Hercules, GQ Mexico, Out Magazine, Manifesto Cover, Made in Brazil Cover, Modern Weekly China, L'Officiel Hommes Germany, El Pais Semanal, MFF Magazine, August Man Malaysia, GQ Spain, Vogue Hommes, L'Officiel Hommes China, The Greatest Magazine, Rollacoaster. Mavi, Dsquared2, Emporio Armani, Calvin Klein. Walked runway for Calvin Klein, Emporio Armani, Dolce & Gabbana, Dsquared2, Gieves & Hawkes, Moschino, Fashion Rocks, Jeremy Scott, Todd Snyder, Cerruti, Frankie Morello, Ermanno Scervino, Philipp Plein, Versace, Gieves & Hawkes, 3.1 Phillip Lim, Custo Barcelona, Carlos Campos, Richard Chai, Ermenegildo Zegna. Represented by agencies New York DNA Models, Paris Marilyn Agency, Milan d'management group, London Unsigned Group. I prefer working out with no gym, outdoors, doing exercises that require no equipment. I think it's truer to your body and gives a more rounded workout, as well as being more fun! The guys at Calvin have treated me incredibly well and helped me out significantly so, again, a very lucky break. I like to workout 2-3 times a week and I've done this for the past 3 years or so. I've recently started doing yoga which I now love.